201 East Main St. - This location was an alley until a narrow bujilding was erected in the space. In 1915 John Nagle had a barbershop here. Then Melroy Blickenstaff owned the shop and had three chairs, Melroy, Forrest Baer and Lloyd "Bugs" Olinger were the barbers. We believe that "Blick," as he was called, had barbershops at other locations as well; he had ads in the Manchester College annual as early as 1921, but possibly all were at this location. The large window at the front of the shop carried a sign made of individual raised gold letters reading "Blicks Barber Shop." Bill Poston tells us that over the years, individual letters dropped off the window until the only letters left were the "O" and the "K." At that point, the shop was dubbed "The OK Barber Shop." In 1944, Otis Brewer bought the shop. The barbers were himself, Pete Evans and Frank Ryan. Pete Evans bought the shop in 1945 and hired two barbers, Bill Poston and Ted Baer. Pete's barbershop still carried the name "OK Barber Shop" in the late 1940s. You could still get a shoeshine in this shop in the late 40s from Billie McKee. His given name was stated as Billie in his 2004 obituary in case you thought it was William or Bill. Long after our study, the building was occupied by a tobacco shop for some time, and then was vacant for a number of years. The Main View Tavern now uses this location for private parties. 141 East Main St. - This was called the J. F. Eicholtz Building. The A. C. Wolfe stoe store was here in 1928, but it was only here until March 19, 1931 prior to moving across the street to the basement of Urschel's Department store. We are guessing at this location for the Style Shoppe. On March 19, 1931, there was a "grand opening" ad for the Style Shoppe at the corner of Main and Walnut Streets and this location would fi that description. The store was a lady's wear shop and a later ad named L. Excol at the owner. The opening date was Saturday, March 21, 1931. In 1932, children's apparel was added. In a January 30, 1933 advertisement, they were going out of business. We also don't know if there was any connection with this Style Shoppe and the Style Shop that opened in the late 1940s on Walnut Street covered later, but we doubt it. The Main View Tavern started at this address around the middle 1930s. Joe Mosier bought this tavern sometime in 1941 after selling his interest in H. M. & M. Cafe (noted later when the north side of Main Street is covered). Mr. Mosier then sold the business by 1945 to Deke Baker, former janitor at the school. (Yes, they called them janitors back then and not custodians) Mr. Baker married Minnie Eilts and when they separated in divorce, Mrs. Baker got ownership of the tavern. She later married George J. "Jot" Freeman and they ran the tavern until his death, then she continued on for many years. During our time frame, the tavern served beer, wine, sandwiches and soup. Outside our time frame, it was taken over by Mrs. Freeman's son, known to all as JP Freeman, and expanded to a full menu retaurant. It has had a number of owners in modern times. The Tavern has also expanded into the 139 address next to it for overflow dining and into the narrow building to its east for a private dining room for parties. An added note - as of this writing, JP Freeman is now an ordained minister, preaching in North Manchester. 135 East Main - This three-story building is the L. J. Noftzger Building, constructed in about 1872. The Masonic lodge, whose emblem is still at the top of the building, moved here that year from the third story of the Young Hotel building. The lodge then moved to a Walnut Street address in 1907. Harry B. York was in business at this address in 1930, the beginning of our study. He operated a dry goods and clothing store which he had purchased from George Heister in 1921 and was here until 1936. Esther Harley operated a beauty shop within the store, according to a June 27, 1932 ad. In a March 19, 1936 article, P. E. Hanson purchased York's store and called it Hanson's. Hanson's, a ladies dress shop, occupied this address until a going out of business sale advertised on September l, 1938. It may have been a play on words, but Hanson always advertised as "The New York Store." The Fashion Shoe Store, owned by Lloyd Rogers, was located here from Saturday, August 26, 1939 until 1947. The fire next door in February 1944 damaged the Fashion Shoe Store's merchandise. An advertisement boasting "All new stock for Fashion Shoe Store after the fire" appeared on March 6, 1944. A July 24, 1947 New Journal article reported that the Fashion Shoe Store was sold to William Felkner and that he would keep the same name. Then on December 2, 1948, John Snell advertised women's apparel but was here only a short time. On December 8, 1949, Julian Goodman advertised, "Goodman's comes to North Manchester" and was here into the 1950s. Jerome H. Greengard owned Jerome's Ladies Wear at this address in later years. As a footnote to this address, Harry B. York died on April 21, 1942. He had been elected Clerk-Treasurer for North Manchester in 1939 after selling his store a few years earlier. 133 East Main St. --Ebbinghouse Brother's Shoe Store was at this location at the beginning of our study. The store was started in 1891 by Albert and Ernest Ebbinghouse and continued until both their deaths in 1930 only a few months apart. Fred Ebbinghouse, son of Albert, was active in the store before their deaths and took charge afterwards. The store closed on June 18, 1938. Glenn W. Ruppel, Charles R. Ruppel and Joseph Ruppel occupied this address as Ruppel Electric, announcing their new location in an ad dated August 14, 1939. An ad on July l, 1943 announced that Ruppel Electric was closed and would open only by appointment for sale of the remaining stock after July 3. Then, for whatever reason, they continued in business for a number of years. Ruppel Electric sold small and major electric appliances; but they may be better remembered by those who were in high school during the 40s as the place you could buy used records - and even listen to them before you purchased. 131 East Main St. Peter Belsito and his brother, Joe Belsito, were the original owners of Belsito Candy Kitchen and Soda Fountain, which they started in 1911. They leased the building from Henry Mills, and then bought it from Dr. George D. Balsbaugh in 1924, It has operated as a candy kitchen and soda fountain since its founding. Peter's brother-in-law Louie Longo worked in the business off and on in the 1930s. The business was sold on Monday, July 11, 1938 to Jerome Soliday and became Soliday Candy Kitchen in 1939. Mr. Soliday did not keep the store and the business reverted back to Peter, who again had an ad on December 19, 1940 and advertised in the College Aurora in 1942. In 1943, Louie Longo and his wife Alexis "Lex" Audra Longo bought the store and operated it into the next century. When we began our research, Louie - who was close to 90 years old - still made all his own ice cream and syrups. He and his wife Lex also made all their milk chocolates. We were saddened to learn from Mr. Longo in September 2002 that he was in the process of selling the store. Many of the teenagers hung out here and at the drug store soda fountains, as well as the Double Dip, during the 1940s. Louie knew every one of the teenagers by name and still recognized them many years later when they walked in the store for a bit of nostalgia. Although Louie operated the store from about 1943, Pete Belsito continued to sell candy until at least 1950. Prior to the death of the Belsitos, Louie and his wife lived in an apartment above the candy kitchen and later moved to the Belsito home on Second Street. We have learned that the candy kitchen was sold in November of 2003 to a young couple that plan to completely renovate the premises and restore it to its original splendor. Prior to publication, we were saddened to learn Alexis and Louie died within a month of each other in early 2004. Louie loved his store and North Manchester. It's reasonable to think of Otho Winger as a part of Manchester College. I personally doubt if Manchester College would be a living - and important - part of North Manchester today if Otho Winger had not come to College in the fall of 1898, and had not agreed more than a decade later to become the College President. When Otho came as a student the College was primarily a Bible School and an academy or high school. The Church of the Brethren was not supportive of education but Otho likely came primarily to prepare to be a minister in the Church. The tuition was a bit more than a dollar a week and board and room cost less than two dollars a week. During the four years he was in College there were four different presidents. One of the four was L. D. Ikenberry and, although Otho was very impressed with him he had no idea that the two of them would work together to build Manchester College for thirty years. "In the middle of the year I quit my studies and started out. It was a different thing then than now to solicit money for a college among the people of the Church of the Brethren. Many of them were not sympathetic. Not many had ever given to the college cause. In fact, giving was not insisted upon very much anywhere. I began my work in Huntington County. It was in the dead of winter; the snow was deep; there were no automobiles to take one from place to place. Sometimes I might have gotten somebody with a horse and buggy to take me, but not many people were willing to do this. So I proceeded on foot from house to house and asked folks for money to help save Manchester College. My success was not very great. Here and there I secured a ten-dollar donation, but not much more than that. ... I remained out until the close of the winter term. I secured only a few hundred dollars, but every bit added to the possibility of the sucess of the venture. I received some very good training for the soliciting I was to do in later years." After finishing a Master's degree at Indiana University in 1907 Otho Winger was called to come to Manchester College to teach history and education. The first term he taught history and education and also classes in English, Latin and philosophy. For the next three years he taught thirty hours a week in several departments but had no administrative duties. Meantime, a new president had been chosen and Otho was chosen as the vice-president. The new president remained only one year. "I shall never forget the night the trustees called me in and said I had been selected President of the college. I frankly told them I didn't think they had selected me because I was best fitted for the presidency but because they thought I was about as well fitted to break my neck trying as anyone else they knew of. I knew the situation and outlook for the school were not good, but I did not know it all. Could I have foreseen what would have to go through, I would certainly have refused, and yet after thirty years, seeing the development and progress of the institution, I am glad to have had something to do with it in one of its most trying periods." That first year was critical. Otho continued to teach a heavy load. Each weekend he solicited money among the churches. Any letter he had to write himself since the school had no money to hire a secretary. Opening day everyone was happy to learn that about 125 were enrolled. But tuition was about $15 a term.. the dormitories were not filled. L.D. Ikenberry was the treasurer and he tried to keep down the expenses and the year closed without a deficit. In 1911 arrangements were made to build a gymnasium. Professor L. D. Ikenberry acted as architect and manager. The town businesses and the faculty were solicited for money and students gave some money but far more work hours.. Now and then a school holiday for half a day gave time for work by faculty and students. Soon there was a gym big enough for basketball. This building later became the Biology building and even later was used by maintenance before it was demolished. It was the first of several buildings built during the Winger years. The second made it possible to have a central heating plant built in 1914.. then in the summer of 1915 a Science Hall.. giving a whole room to chemistry and another for biology. It also housed agriculture classes and practical crafts such as woodworking. This building became the library and, more recently the Communications building. Enrollment of women was increasing and in 1916 a wing of Oakwood Hall was built which also included a dining hall. In the midst of the expansion, which included increasing enrollments, war came and attendance declined as men entered the war. And a very different crisis faced the College.. The flu came to campuis. School was closed for four weeks.. Most of the students stayed on campus since the situation in their home areas was no better. At its worst there were 65 cases on campus and few well enough to care for them. President Winger spent most of his time trying to do what was possible for the men. Two of the students were faithful help for the women. Four students died: three at their homes and one on campus. Soon after the flu experience, the armistice was announced and that demanded a special celebration. A new bell had just arrived destined for the Mission Chapel. It was still in a crate. No one asked permission: it was quickly loaded on a truck which drove through the streets of town that whole day and far into the night, students ringing the bell to express their joy. a home management house and in the early '70s it became Aafro house before it was sold to a private owner. In 1919 a church as built on the west side of town called the Mission chapel. Students had been having Sunday schools in private homes for several years. Money was solicited to build a church and equip it and it was used for a number of years for a variety of religious services. By this time the enrollment had reached 500 and buildings were crowded. After much discussion it was decided to join the College Hall and the Bible buildings and call the large building that would be formed the Administration Building. Begun in the summer of 1920, it was dedicated in January 1921. A former governor of Pennsylvania and former president of Juniata College (a sister college to Manchester), gave the address. This building more than doubled the classroom space. Then the size of Oakwood Hall was doubled in 1926. The gymnasium had been too small for some time and in 1926 a new combined gymnasium-auditorium. Work was begun in August and by the first of January they were playing games in the new building. Winger reported that "this entire building, heated and seated, cost us less than $60,000." A women's gym was added twelve years later. The Goshorn Chemical Laboratory was erected with funds given originally by George Goshorn of Clay City to his home church with the condition that if that church ever closed, the money was to be used by his brothers as they saw fit. So it came to Manchester. Meantime, more land was purchased, little by little as it became available until the campus reached the Eel River and included the college woods. Winger describes how these buildings were built with the limited funds available to the College. L. D. Ikenberry was "a practical builder and helped to supervise most of the buildings that had been erected." No architect was used. Local artisans were used under Ikenberry's direct supervision. He also purchased the materials and, at least on one or two occasions purchased used bricks. It was not until the 1920s that the College took on a strong aura as a college. Dean V. F. Schwalm and Professsor A. W. Cordier received their Ph. D. degrees from the University of Chicago, and C. Ray Keim, also with a Ph. D. from University of Chicago, joined the faculty. Charles Morris joined the faculty in 1926 though he did not have a Ph. D. until 1930. Dr. Schwalm left to become President of McPherson College. Carl Burt and Robert Stauffer led a strong program in athletics and physical education. George Beachamp who came to the faculty in 1929 had the ability and the enthusiasm to take Manchester to the front in debating and built up one of the largest debating tournaments in the United States. Professor Paul Halladay came in 1928 and led the music department in achieving a strong postion. When Mt. Morris ( a sister institution ) was forced to close we gained only one professor, O. W. Neher, and he added strength to the biology department. Many other strong professors with Ph. D. degrees were added: Lloyd G Mitten in commercial, Robert H. Miller in Bible, O Stuart Hamer in education along with Nettie N. Leasure in 1936 and Samuel L. Flueckiger in music. Dr. Lucille Carman came as staff in the hospital and Harry Weimer came in 1938. So from a small beginning, the College had a faculty of more than forty members, twelve with a Doctor's degree and even more who were well prepared, by the end of Winger's tenure. Attracting students was a critical aspect of growth. In 1911 the number of students was very low; there had to be more if the College was to survive. As Winger described that summer he said, "If I could have worked more hours of the day, I would have done so." On enrollment day, he was keenly anxious. At the end of the day there were one hundred twenty-five registered; the largest enrollment for several years. From that time forward, it was a steady climb. Faculty and students were strong boosters. The new buildings helped. By 1917 it was more than 550. In 1923 there were l,015. Near the end of his presidency he claimed more than ten thousand different students had been enrolled during his time here. The academy closed in 1923 and after that all the students had regular college standing. At the same time the alumni group was increasing and spreading strong support for the College. membership in the North Central Association. The administration asked for a survey in 1931 and were very uneasy about the results. President Winger reported that "It was one of the happiest moments of my thirty years when it was announced at the meeting (of the North Central Association) that Manchester had been admitted to the Association." And so, as Winger writes, "the years went by." He found no place to "slacken pace." "Really, I never knew how to be president of a small college like Manchester without doing a lot of work." But he was finally slowed by illness. In 1936 he developed a serious infection back of his eye. It formed a dangerous pocket of pus. They tried to keep him in the hospital until it could be done but he refused, did some high school commencement addresses, but it continued to worsen. He lost one eye: it was removed in spring, 1938. This experience became a turning point for him. His statement: "I began to realize that I had had a serious sickness that, combined with my age, had greatly weakened my constitution." In 1940 he had an attack of peripheral paralysis. In September, 1940 he prepared his last report to the Trustees. His resignation took effect as the end of that school year. In that year he wrote "Memories of Manchester" from which these materials have been taken. During the busy years as president he had also written other books among which was a History of the Church of the Brethren in Indiana and a series of little books about Indian history in the local area. In 1945 he wrote "And now I am old and tired. There are still things I long to do but I cannot. I have done my best for my church, my school and my family and for God. I will try to be satisfied." 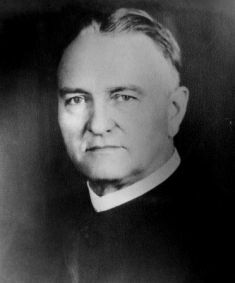 Otho Winger died August 13, 1946 and his funeral sermon was given by Dr. Vernon Schwalm."